Athletes in Action (AIA), an international humanitarian-sports organization, holds the fun run dubbed as the "Schools Run for School Rooms” (SRSR) on July 7, 2012 to be held at the Bonifacio Global City in Taguig City. This is to raise funds for the rehabilitation of schools in Iligan City that were destroyed by Typhoon Sendong. This run will be participated in by student runners from major universities in Metro Manila, groups from government agencies, private corporations and churches, as well as running enthusiasts. Assembly of participants is at 4:00 a.m., as gun start is at 5:00 a.m. Proceeds of the event will be used by the AIA to rehabilitate classrooms in Iligan City. Iligan City is among the worst-hit places in northeastern Mindanao by Typhoon Sendong in December 2011. AIA is also partnering with the GMA Kapuso Foundation and iCare Foundation for this project. The GMA Kapuso Foundation will facilitate the rehabilitation of the classrooms. SRSR is co-presented by leading sporstwear brand Fila. Other sponsors include Sony, Gardenia, Cherifer, Oracare, Pocari, Treelizer, and Air Conserve. SRSR media partners include GMA Network, BusinessWorld, and Philippine Daily Inquirer. SRSR is organized by events management specialist, Huper International. For more details, call (632) 661-6049 or email athletesinaction@huperinternational.com. 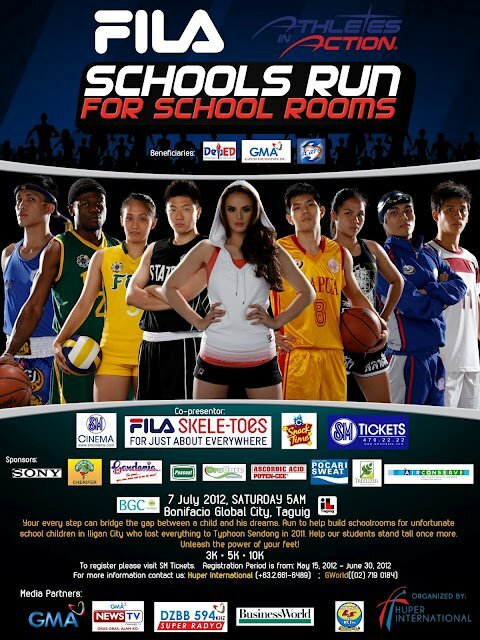 1) Buy a ticket of Athletes In Action-Fila Schools Run For School Rooms (AIA-Fila SRSR) advocacy run at SM TICKETS – CINEMA COUNTERS anywhere in Luzon, except in SM malls without cinemas like SM Makati (Ayala), SM Harrison, SM Cubao, and SM Quiapo. 2) After ticket payment, payee will receive SM-issued ticket as proof of payment and SM control number-coded AIA-Fila SRSR Registration Form. Payee must attach/staple SM-issued proof of payment ticket to the Race Kit Claim Stub. NO SM-ISSUED PROOF OF PAYMENT TICKET ATTACHED TO THE RACE KIT CLAIM STUB, NO RACE KIT RELEASE. 3) Participant to completely fill out AIA-Fila SRSR Registration Form and keep Participant’s Copy portion of the Registration Form. As Fila’s goodwill, payee may avail additional 10% discount on Fila Running Shoes and Skele-Toes, which are already on sale at 50% OFF, upon presentation of AIA-Fila SRSR Participant’s Copy at Fila stores. 5) Upon turnover of accomplished AIA-Fila SRSR Registration Form and Race Kit Claim Stub with SM-issued proof of payment ticket to FILA personnel, participant will receive AIA-Fila SRSR race kit. Exchange of singlet for appropriate size is accepted at the same Fila store within seven days or until July 4 provided the singlet remains new and unworn. 6) No registration at FILA stores. Participating FILA stores are for submission of accomplished Registration Form and claiming of Race Kit only. 7) Race Kits may be claimed at participating Fila stores from June 25 to July 4 only. For any inquiries, call Huper International at (632) 661.6489 and/or GWorld (632) 215.0512 or 719.0184.